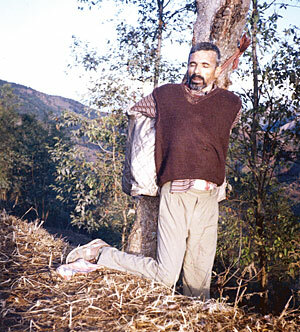 The photo of teacher Muktinath Adhikari, killed in 2002 and left tied to a tree by Maoist insurgents, shocked the nation, and beyond. (c) Nepali Times. Elections take place on Nov. 19 for a new constituent assembly in Nepal. Despite fears of not achieving a ‘free and fair’ vote – and even the possibility of violence – many Nepalis hope desperately that the exercise will set the country on the path to recovery six years after the end of conflict between the state and Maoist insurgents. Relatives of victims of human rights abuses during the conflict are less hopeful. Earlier this year the caretaker government led by the former chief justice introduced an ordinance that would provide amnesty to perpetrators of human rights abuses committed during the 10-year conflict. There are reports that political parties vying for election are promising to finally get to the truth behind the abuses during the conflict, but not that they will embark on punishing those responsible.Suman Adhikari leads one of the non-governmental organizations that’s behind a challenge to the ordinance in Nepal’s Supreme Court. His father, a teacher and activist, was killed by Maoists in 2002 for not handing over to them a chunk of his salary. The photo of the dead teacher roped to a tree shocked the nation, and is one of the enduring images of the conflict. “If the government continues to ignore the damage that has been done to the underlying grassroots movement and the suffering caused by the conflict, sustainable peace is not possible,” warns Adhikari in a recent article in the Kathmandu Post. Having watching Nepal’s governance process fail miserably in the past seven years it is tempting to see such human rights concerns as marginal to the fundamental task of simply getting a working government in place, and every-day life restored. But in a country now so riven by the ethnic divisions that were exploited by the Maoists during the uprising, I wouldn’t bet on it. And certainly a new government will be ethically bound to create both the truth and justice commissions promised in the Comprehensive Peace Agreement of 2006. Moving ahead with the amnesty ordinance, on the other hand, would violate international standards, as outlined by UN High Commissioner for Human Rights, Navi Pillay. This entry was posted in Elections, Human rights, Nepal, truth and reconciliation and tagged impunity, Nepal civil war by martylogan. Bookmark the permalink.